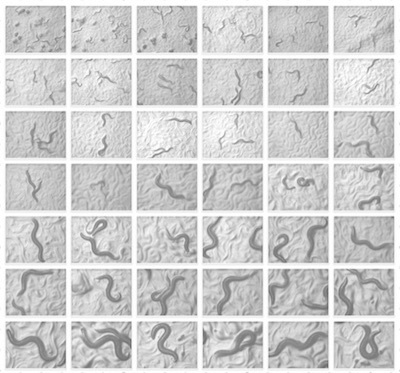 Developmental progression of C. elegans from egg to adult. TiMetab is a project funded by the European Union’s Seventh Framework Programme for research, technological development and demonstration under grant agreement nº 627263. We aim to understand the reciprocal relationship between metabolism and biological rhythms, namely circadian and developmental oscillations. We use C. elegans as a model system. Right: Developmental progression of C. elegans from egg to adult. Bottom: High-throughput detection of the 4 larval stages in C. elegans development (yellow-green) and the four molting/lethargus periods (red). See project publication for a description of this method. High-throughput detection of the 4 larval stages in C. elegans development (yellow-green) and the four molting/lethargus periods (red). See project publication for a description of this method.